The album is a sixteen track collection of inventive, timeless music peopled with a typically irreverent cast of characters. "It has synthesizers. And songs about synthesizers," Neil says. "But don't panic. It also has guitars, orchestras, accordions, and songs about love and greed." Office Politics was written, produced and arranged by Hannon, and recorded and mixed in Ireland and London by Ber Quinn and Guy Massey. Additional orchestral work was captured by Jake Jackson at Air Studios, and the LP was wrapped up and mastered at the legendary Abbey Road Studios. Additional guest & backing vocals come in the form of Chris Difford, Cathy Davey, Thomas Walsh & Pete Ruotolo. Not your ordinary 9 to 5 existence, Office Politics central characters are the machines - or 'Infernal Machines' as one track rages. "I do try to make normal records," Neil says with a smile. "But it always seems to wander off into odd territories." 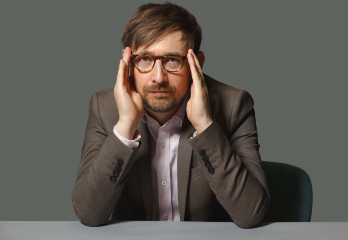 The Divine Comedy will play Brighton Dome Concert Hall, on Wednesday 16th October 2019. Tickets on sale from 9.00am on Friday 12th April at www.thedivinecomedy.com.